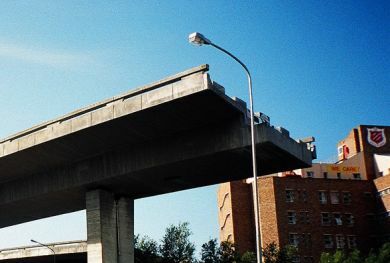 Anybody who has ever been to Cape Town is likely to be familiar with its famous flyover bridge that stops in the middle of nowhere. Work on the flyover commenced in the 1980’s and for some or other reason came to grinding halt never to be completed. Many years ago when I was scholar attending Sea Point Boys High there was a story going around that somebody had accidently ridden a motorcycle over its edge and miraculously survived. I had put it down to urban myth until some years later; I encountered the person who actually did it. In 1989, in the days of compulsory National Service, I was posted to Ysterplaat Air Force Base five minutes away from the Cape Town CBD. There I met a rather grumpy old sergeant in the permanent force with enough steel in his jaw to raise hell with metal detectors. Another permanent force member who served in my unit knew the story well and took tremendous pleasure in sharing it with whoever would listen. It turns out that our intrepid motorcyclist had acquired his 1100cc that same morning and thought it was a good idea to meet some friends for drinks. After a day of heavy drinking at the Kings Hotel (a famous Sea Point drinking hole in its day) he apparently struggled to get himself and his motorbike going. His friends, in doing what real friends do in these circumstances, held the bike steady for him and helped him on his way. In those days, where the road forked leading to the drop, it hadn’t been barricaded as it would be today. Instead, they had placed a couple of white painted 80 gallon drums with no entry warning sign’s planted in them. It would have perhaps been impossible for a car to fit through however a motorcycle could do so with relative ease. He apparently drove straight through the gap between two barrels and happily continued. Needless to say, he woke up sometime later in hospital and as soon as he was fit enough to resume work, in a move of deliberate irony that one would expect of the military, he was placed in charge of the Airman’s bar to serve as reminder to young servicemen, not to drink and drive.